Hey what is it with that chicken? We have a pen full of Red Broiler chickens, bred for meat production, they don’t grow as quickly or have the health problems of Cornish Cross, but they do get larger faster then some of the other breeds, say a chicken hatched here on the farm, by a duck. You may recall the earlier posting of the duck that surprised us by sitting on a nest of chicken eggs. Rick had taken all the duck eggs out of the nest, but the ducks accomplice, Henny Penny, replaced them with chicken eggs. A few weeks later we figured it out when we saw a little chick under the duck. 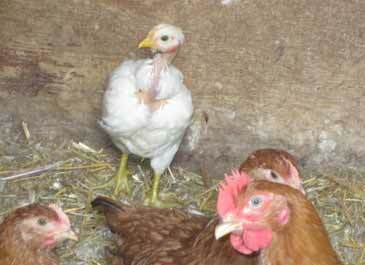 At the time we thought there might be a slow hatch out of chicks, but that wasn’t the way it turned out. Eventually all the eggs disappeared and no more chicks appeared. Still there was that one little orphan chick, alone under a light in a brooder box, unhappy, complaining, chirping a sad song, hence the name “Cranky”. Our idea was to give Cranky some friends, three of the red broilers (all named Rudy). Cranky settled down, no more complaining. Eventually Cranky and the three “Rudies” were all reunited with the other 23 chicks. To this day Cranky stands out, smaller then his coop-mates; he is a quarter the size of the “Rudies”. With his off white down and his featherless neck (Cranky is a Turken) he looks like an alien. Whenever people see him they ask “Hey, what is it with that chicken”? And we say “Oh, that’s Cranky”. For us, his (her?) name seems like a good enough explanation. But that does remind me of another story that seems related. A few weeks ago a duck hatched out one duckling. The mother duck would not get off the nest and the little duckling went exploring on it’s own. Not a good plan for a tiny fellow in the wild, wide, world. So we put that duckling in with the Rudies + Cranky, but the chicks kept pecking at the ducklings webbed toes, lifting him up and over on to his back. Otherwise known as flipping the bird.